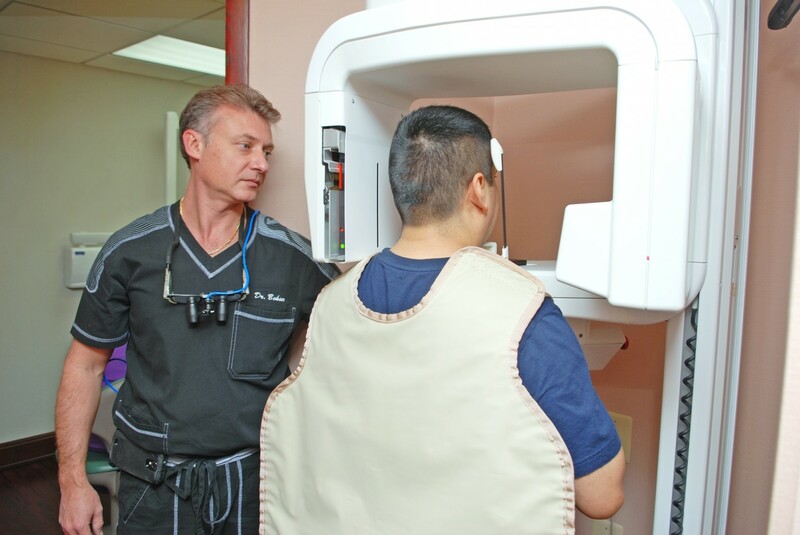 Digital x-rays can each be used to examine teeth for virtually any problem or disorder. They are programmed for magnification, colorization, and measurement to give the dentist the highest level of accuracy. Images can be magnified 1800x. This procedure increases the dentist’s diagnostic capability tremendously. Digital radiography utilizes computerized equipment and software to capture x-ray images of your mouth and teeth. We do this by exposing a small sensor, or plate, that feeds the image into a computer. They are faster, producing images that can be viewed almost instantly. They’re safer, with no chemical development and significantly less radiation. Images can be stored electronically and emailed to specialists and insurance companies. Taking x-rays is faster because the sensor is merely moved from tooth to tooth, and your x-ray can be seen on a computer monitor just moments after exposure. There’s no waiting for chemical development, as with film packets. It’s also faster because x-rays are available within moments on the computer monitor, with no development step in between. Digital x-ray technology enables more efficient diagnosis and treatment because it provides a large, easy-to-see image, and it allows us to make adjustments and see details in the x-ray images. The digital x-rays can then become part of your dental record and be easily emailed to specialists and insurance companies. With digital radiography, we can offer you faster and safer diagnosis and dental treatment. Medical conditions such as cancers and infections can be picked up using Digital Panorex. Digital full face imaging allows anatomically correct geometry, elimination of shadows and constant magnification. Used for a comprehensive diagnoses with less radiation for one photo of your whole lower face including TMJ joints. Dental radiographs, or x-rays, are an important part of a thorough dental examination. A full set of x-rays is usually required for patients who are new to a dental practice or who need extensive treatment. Two to four follow-up or check-up x-rays called “bite-wings” are necessary every 6-12 months, depending on each individual patient’s needs. The most common questions concerning dental x-rays deal with: why they are needed, the amount of radiation exposure, and the safety during pregnancy. Dental x-rays are important for many reasons. They can expose hidden dental decay; reveal a dental abscess, cyst or tumor; show impacted or extra teeth; and also help determine the condition of fillings, crowns, bridges, and root canals. Dental x-rays can also reveal bone loss from gum (periodontal) disease, locate tartar buildup, find foreign bodies within the gum or bone, and see if there is enough bone for the placement of dental implants. These are just some of the many reasons why dentists rely on dental x-rays. Some people worry about their exposure to radiation during dental x-ray procedures. Our practice is very concerned about minimizing the amount of radiation a patient receives at our dental office. That’s why we use digital x-rays and cover patients with a lead apron during x-ray procedures. You will be happy to know that digital x-rays expose you to less than 1/100th the amount of typical annual background radiation for someone living in the New York City area. Dental x-rays are both safe and effective, and can be used during pregnancy. Dental x-rays are an important tool in the diagnosis and treatment of dental problems. They do not, however, replace the need for a visual examination of the head, neck, TMJ and oral cavity. It is only with a combination of both the x-ray and the visual examination that the dentist can best treat his or her patients. An intraoral camera is a camera which is designed to be used in the mouth for the purpose of taking video or still photography. These cameras are most commonly used in dental offices, with several firms specializing in producing intraoralcameras and accessories. One of the primary uses for an intraoral camera is in patient education. Dentists often find it helpful to be able to show patients exactly what is going on inside their mouths, and to highlight areas where medical attention may be needed. Patients are also less likely to defer or refuse procedures when they can clearly see the area at issue, as some people are suspicious of recommendations for dental procedures, due to concerns about cost, potential pain, or the fears about members of the dental profession. In addition to being used in patient education, such cameras can also be used to take clear visual records for patient files, and to generate material which can be used in consultations and discussions with other dental providers. For example, a general dentist might use an intraoralcamera to take images of a tooth or area of the jaw which requires oral surgery so that a maxillofacial surgeon can examine the information before he or she meets the patient to get an idea of the kind of surgery which might be required. Images taken by an intraoral camera can also be reviewed later, which can be useful for a dentist who feels a nagging suspicion that something is not quite right in the mouth of a patient. 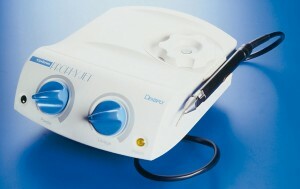 The intraoral camera can also be used to document procedures for legal and educational reasons, and to create projections of a patient’s mouth which can be used in medical schools for the purpose of educating future dentists about various issues which pertain to oral health. The intraoral cameras designed for use in dental facilities come with disposable probes or probe covers to ensure that germs are not passed between patients, and they may come with a variety of options which enhance the functionality of the camera. Versions designed for home use are usually much more basic, but they can still be useful for people who want to see the inside of the mouth. Using a camera at home, someone can identify an issue which requires a dentist’s attention, keep an eye on a recovering surgical site, or teach children about the importance of oral hygiene. PROPHY-JET is an air polishing prophylaxis system which uses air, water, and either sodium bicarbonate powder as a slurry to remove extrinsic stain, dental plaque and soft debris while simultaneously polishing tooth surfaces. A loupe (pronounced loop), is a type of magnification device used to see things one is looking at more closely. In this respect, they are simply a form of a modified microscope, allowing the dentist to be able to better apply the phenomenon of microscopy to his or her trade. Our dentists use binocular loupes with a self-contained light source to better scrutinize the entities within our patients’ mouths in order to make a better diagnosis. For example, it may allow for more precise determination of how far a crack proceeds along the surface of a tooth. Loupes are also used in order to perform on a more precise level; while dentists drill teeth on a millimeter scale, magnification can enlarge the dentists’ view of the teeth, making it easier to inspect teeth for decay and/or see things that ordinarily would not be seen without magnification.